In the last SEJournal, I wrote about the environment beat’s maturity. Now, in this last column of my presidency, I’d like to address its necessity and SEJ’s role in it by focusing on two events, one just past, the other approaching quickly. Recently, Tom Henry, the Toledo Blade’s fine environment reporter, spoke in his Ripple Effect blog about the August 2014 water contamination caused by toxic blue-green algae in his city by the lake. He wrote that it’s a “game changer” for local government, state politics and public health. The water crisis that affected 500,000 in Toledo brought into focus not only the core importance of environmental and public health issues, but also the very real and vital role that good, knowledgeable reporting plays in informing the public. The coverage drew on local, state and national sources and included an important story about official accountability based on information obtained in a right-to-know request. Those documents showed local water authority officials deferred maintenance that may have prevented the problems caused by the pea-green mat of algae surrounding the city’s water intake in Lake Erie. Tom’s experience benefited his coverage, which has drawn national praise. It is not a stretch to say that his journalistic skills and knowledge base are informed and strengthened by his participation in SEJ conferences, his service on the SEJ board, his ongoing role as SEJournal book editor, and his many organizational friendships. Which brings me to the second event: The 25th anniversary of this important community of professional friends, this Society of Environmental Journalists. It is a noteworthy anniversary and an appropriate time, I think, to acknowledge SEJ’s founders, how the group came to be and what it has become. SEJ was not born into the journalistic universe kicking and screaming, though we’ve since made up for lost time. The idea had a lengthy gestation in the 1980s against an increasingly hard to ignore environmental backdrop that included the discovery of a hole in the ozone layer over Antarctica (1985), a meltdown in Chernobyl (1986) and the reefing of the Exxon Valdez in Alaska’s Prince William Sound (1989). According to an account by Jim Detjen, who was then covering the environment at The Philadelphia Inquirer, discussion about the need for an organization to support journalists writing about those issues came up over several years and several drinks with New Orleans Times-Picayune environment reporter Mark Schleifstein at Investigative Reporters & Editors conferences. On a parallel track in the spring of 1999, David Stolberg, then the assistant general editorial manager of Scripps Howard Newspapers, pitched the idea to Dennis Anderson of the St. Paul Pioneer Press Dispatch and Kate Long and Paul Nyden of the Charleston Gazette, that year’s Edward J. Meeman national environmental writing award winners. They endorsed it and sent a letter seeking support to Detjen and other Meeman winners from previous years. On Sept. 1, 1989, Detjen was one of 17 winners of the Meeman and Thomas Stokes national journalism awards who signed a letter mailed to journalists around the United States, asking if there was interest in forming such an organization. Joining Detjen, Anderson and Nyden as signatories of that letter were Marla Cone of the Orange County Register in Santa Ana, CA; Kevin Carmody of the Potomac News in Manassas, Va.; Bill Dietrich, Tom Long and Natalie Fobes of the Seattle Times; Jane Kay of the San Francisco Examiner; Deborah Frazier of the Rocky Mountain News; Shannon Tompkins of the Beaumont Enterprise in Texas; Bob Anderson and Michael Dunne of the Baton Rouge Morning Advocate; Thomas Morton of the Colorado Springs Gazette; Richard Boyd of the Enterprise in Lexington Park, Md; Steve Meissner of the Arizona Daily Star; and Jonathan Harsch of Maumee, OH. More than 100 journalists responded in support of such a group and SEJ was officially incorporated on Feb. 14, 1990. The first appointed, interim board was headed by Detjen as president; Rae Tyson of USA Today and Teya Ryan of Turner Broadcasting as vice presidents; Noel Grove of National Geographic as treasurer; and Bob Engelman of Scripps Howard News Service as secretary. Other board members included George Dwyer of ABC News; Julie Edelson of Inside EPA; Janet Raloff of Science News; Howard Chapnick, a photojournalist at Black Star Publishing; Bowman Cox of Pasha Publications; Tom Meersman of Minnesota Public Radio; Carmody; Anderson, and Nyden. Others playing prominent founding roles in SEJ were Bud Ward, then editor of Environment Writer, who hosted SEJ’s first organizational meeting in Washington, D.C. in December 1989; Jay Letto, then working as environment program director at Scientists’ Institute for Public Information, and since 1993 SEJ’s conference director; Phil Shabecoff, executive publisher of Greenwire; Emilia Askari, then the environment reporter at the Detroit Free Press; and Beth Parke, who quit her job as senior producer and host of “Consider the Alternatives,” a nationally syndicated radio series in Philadelphia, to become SEJ’s first and only executive director. 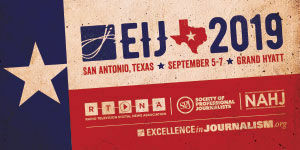 I list the names of all of these SEJ founders to note the group’s wide professional and geographic reach, and to humbly recognize their important contributions to, and vision for, this community of journalists and journalism educators. Hopefully it will make it easier for us to remember them and thank them when we see their name tags at next year’s annual conference in Oklahoma. And going forward, their work building SEJ should continue to inspire our own. As envisioned by the founders, the “forum” that has emerged over the years has proven invaluable for teaching and guiding journalists, and also for helping supply us with the confidence and courage needed to report on the world’s most important stories. It has grown and will continue to evolve, through new leaders and new programs. Let’s use the coming anniversary to renew the group’s commitment to improving the quality, accuracy and visibility of environment reporting at a time when more and more of our members, like Tom Henry, are covering game-changing stories and battling daily to protect the public’s right to know, while navigating the selfserving spin and lack of transparency increasingly employed by government and industry. It’s been 25 years, and there’s still nothing fluffy about any of that. Don Hopey covers environment at the Pittsburgh Post-Gazette. A long-time SEJ board member, he is now treasurer and finance chair. The new president, Jeff Burnside, will contribute this column starting next issue. * From the quarterly newsletter SEJournal, Fall 2014. Each new issue of SEJournal is available to members and subscribers only; find subscription information here or learn how to join SEJ. Past issues are archived for the public here.